GRAND RAPIDS October 12, 2015– As members of ATU Local 836 continue to fight with The Rapid to preserve their pension, one Democratic candidate for president has come out in strong support of the bus drivers and mechanics– Senator Bernie Sanders of Vermont. 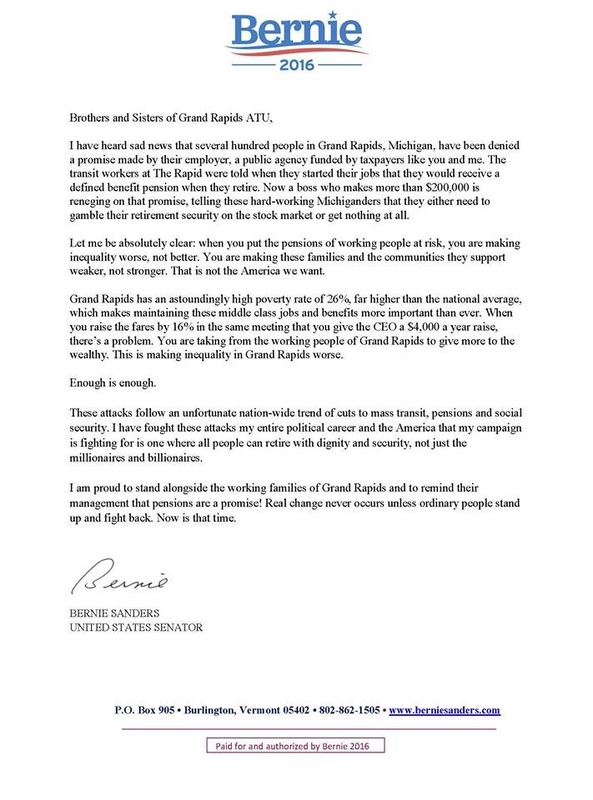 While the letter Sanders sent was addressed to the members of Grand Rapids ATU, the message was likely meant to urge the members of the board of the Interurban Transit Partnership to honor the defined benefit pensions of the region’s bus drivers and bus mechanics, and to not shift funds into a stock market-based retirement plan. Sanders has represented Vermont in the Senate since 2007. Before that he served in the House of Representatives, representing Vermont’s single at-large district. He has served as an independent, forgoing membership in either of the two major parties, and self-identifies as a democratic socialist. The letter concludes with Sanders urging the members of ATU Local 836 to stand strong and fight for what has been promised to them. To read the full letter from Sen. Sanders, click on the thumbnail above. This entry was posted on October 12, 2015 by WMALC in Local news and tagged ATU, Bernie Sanders, Grand Rapids, retirement.